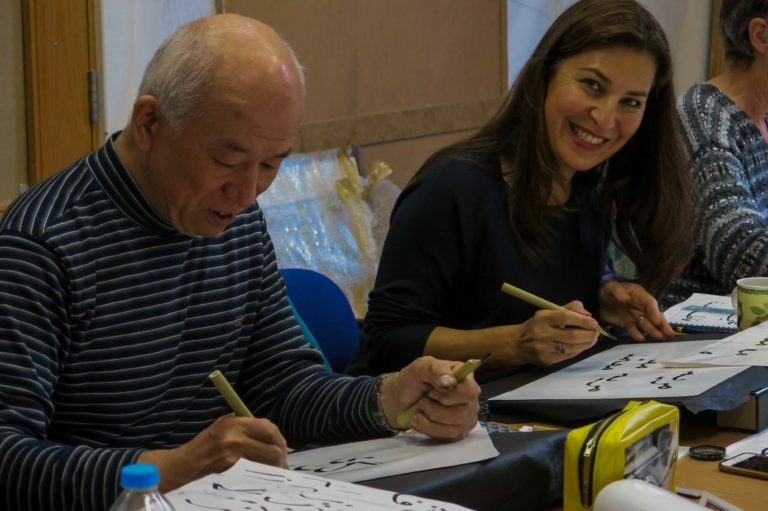 From 10 – 14 October, we were delighted to be joined by Arabic Calligraphy master, Koichi Fuada Honda and his assistant Koichi Yamaoka in two courses at The Prince’s School of Traditional Arts. Koichi Honda as Venetia Porter explains, is a key artist in developing the popularity of Arabic Calligraphy in Japan, taking part in numerous calligraphy festivals in the Middle East, with exhibitions there and in Japan and Europe. His assistant, Koichi Yamaoka is the Secretary General of the Japan Arabic Association. The series gave students the opportunity to take one or two consecutive courses in two distinct Arabic Calligraphy scripts, Naksh and Diwani. Koichi Honda and Koichi Yamaoka demonstrated the techniques and the intricacy of these two styles in these popular courses supported by the Bagri Foundation. The week began with an introduction to Naskh Script, a popular form of Arabic Calligraphy. Naskh, as Porter states, is ‘the copyists’ hand, mainly used from the twelfth century for writing government documents in addition to copying the Qur’an’. The students of this course were introduced to Naskh, learnt about Arabic Calligraphy tools, the shapes of the script and created their own name and simple sentences in the style. From mid-week, students could take an intermediate course in Diwani Script, a very harmonious and cursive style. Diwani as Porter explains, was ‘developed by Ottoman Turkish calligraphers during the fifteenth century and often used on official documents such as firmans’. In the course, students practiced the Arabic alphabet, writing letters in their unconnected and connected form before moving on to words, sentences and completing a final artwork in Diwani.